Why should you use WP One Time File Download? WP OTFD plugin will help to grow your audience and engage more visitors on your website. A direct link to a file can be sent via multiple channels like Slack, Messenger, Skype etc. and the user doesn’t have to visit your website to download it. 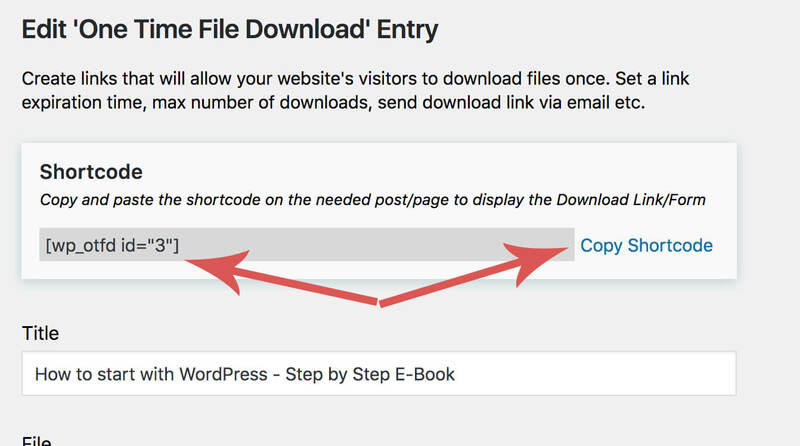 Our plugin comes with a solution: it generates unique download links for each visitor and once it was used to download the file, it will not work anymore. 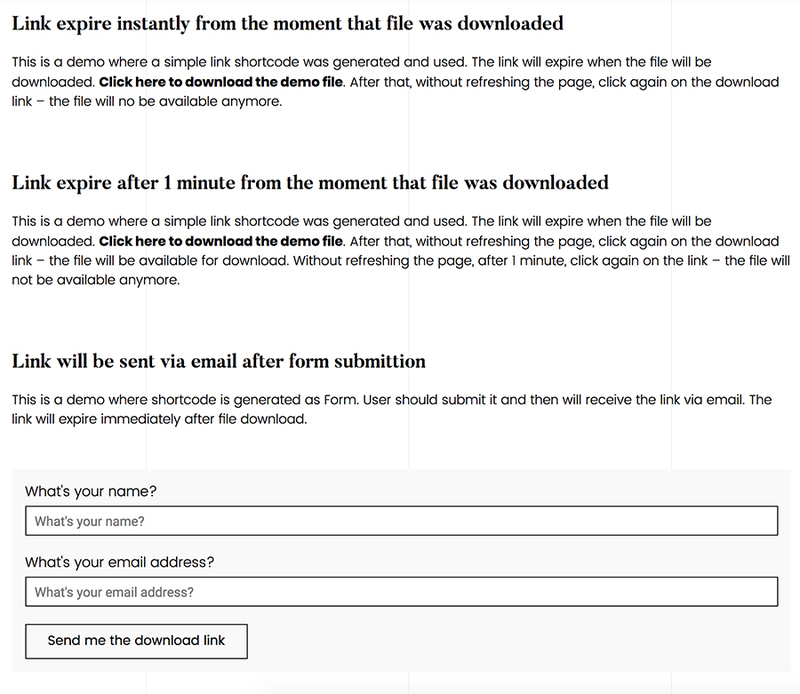 Of course, you can set a validity period for a download link – for example, 10 minutes from the moment that file was downloaded, or 1 day or any value you need. Create shortcode in seconds. Go to admin dashboard -> WP OTFD page and click on “Create new”. Then you’ll have to add the title, select the file, set expiration time, choose the link type and that’s all. When the shortcode is generated, you can use it into your pages/posts you need. Just copy it from the dashboard WP OTFD page. When the shortcode is added to a page/post, the link should be generated automatically. If you opted to send the link via email, then a form will be displayed. WP OTFD admin dashboard: click on the “Generate Unique Link” icon to get a new download link. Need To Generate A Link Manually? There can be some cases then you’ll need to send some download links via messengers, email or other IM channels. 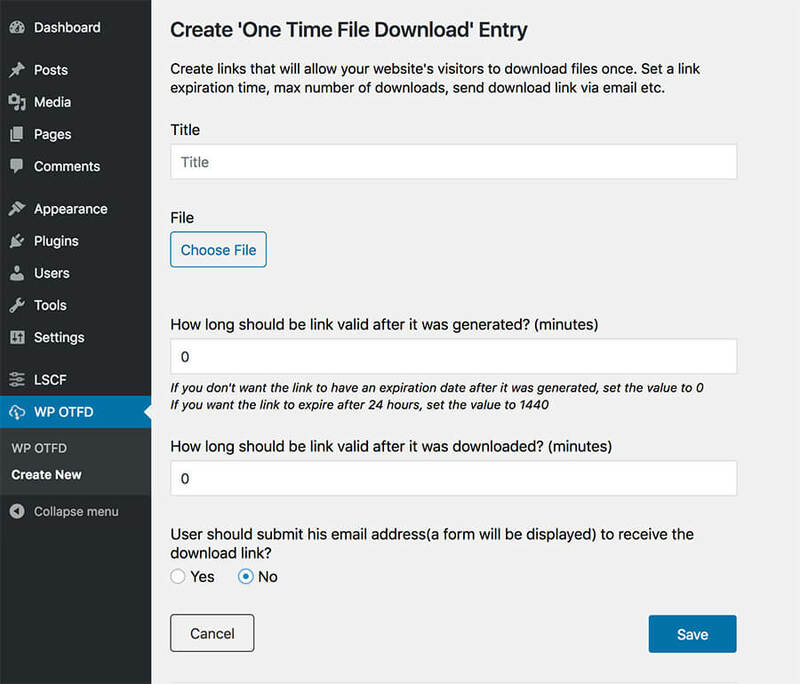 WP One Time File Download is perfect for this situation: you can generate a quick link from admin dashboard. This is a demo where a simple link shortcode was generated and used. The link will expire when the file will be downloaded. Click here to download the demo file. After that, without refreshing the page, click again on the download link – the file will no be available anymore. This is a demo where a simple link shortcode was generated and used. The link will expire when the file will be downloaded. Click here to download the demo file. After that, without refreshing the page, click again on the download link – the file will be available for download. Without refreshing the page, after 1 minute, click again on the link – the file will not be available anymore. This is a demo where the shortcode is generated as Form. The user should submit it and will receive the link via email. The link will expire immediately after file download. We suggest to try the product and see how it works, check all the functionalities and get in touch with our customer service. If it’s not exactly what you’re looking for, you can create a refund request within 15 days after purchase. Need WP OTFD on your WordPress Website? You’ve searched for a plugin like this and now found it. Simple to use, setup it in seconds, well documented, created by a team of professional developers to deliver consistent and measurable results.